Despite being an institutionalised bourgeois of many years standing, in my heart of hearts I am a bohemian. Daily, I starve in my cold water garret, suffering for my art and the love of a petite Parisian who is dying of consumption. At least in my heart of hearts. Outside of my heart of hearts, I am a slave to the system, much like everyone else. So as the curtain lifted on La Bohème at The Lowry, I was transported to that cold water garret in Paris of my imagination where, for just over two hours, I suffered for my art and the love of a petite Parisian dying of consumption. And it was glorious. 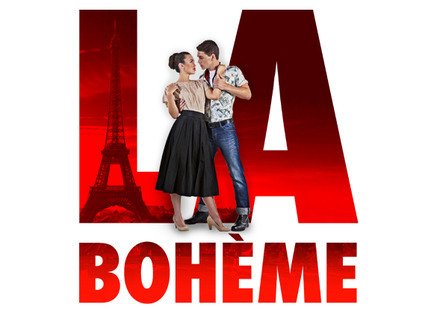 The story of La Bohème is as old as Romanticism itself. Rodolfo (Ji-Min Park) is a struggling writer in 1950s Paris, hanging out with his struggling artist mates, Marcello (Duncan Rock), Colline (Barnaby Rea) and Schaunard (John Savournin), getting by on borrowed wine and bonhomie. It is a cold Christmas Eve without cheer or good will to all men. But our lads get by and even manage to revel in their boheme by throwing landlord Benoit (Jeremy Peaker) out the door without a sous of his back rent. Well, what else would bohemians do for Christmas. As the lads head off to Café Momus, Rodolfo stays in to finish an article he is working on. I mention this only to gain some sympathy as it is seven minutes to midnight and I, too, am finishing an article. There is a knock at the door and into his life walks Mimi (Anita Watson) looking for a light for her candle (a sexual metaphor if ever I saw one). As if to demonstrate the difference between fiction and reality, I too wait for someone to knock at my door looking for me to light her candle and but none arrives. 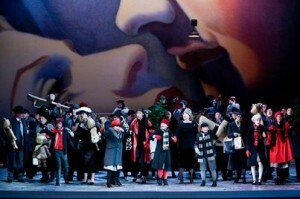 On stage, Mimi and Rodolfo fall madly in love and live happily ever after. The end. Ha, you nearly fell for that one, didn’t you, you Hollywood-fed heathens. This is cold, suffering, romantic Paris. If you want a happy ending, go and see something with Jennifer Aniston in it. As Mimi coughs her way into Rodolfo’s life, you know it isn’t going to end well. The second act bounces around with a rousing, ravishing and robust tour de force of a café scene from director Phyllida Lloyd and revival director Michael Barker-Caven. It is a crowd-pleasing, ingenious piece of ensemble choreography that finishes with a Santa marching band that visually and musically takes your breathe away. In the midst of this Christmas carousel, Marcello is reunited with his lover Musetta (Sky Ingram) who adds a blousey, grandstanding performance to it all. It leaves you gasping for the interval and time to ready yourself for the brooding and dark acts to follow. Act Three opens with moody jealous rages from Rodolfo and Marcello who cast Mimi and Musetta out of their miserable bohemian lives. In the last act, the boys are back together in their garret, pondering on lost love and making art from their collective broken heart. That’s what romantics do, isn’t it? As Rodolfo, Marcello, Colline and Schaunard jolly along, Musetta brings a dying Mimi to see Rodolfo one last time. Opera is full of last act deaths but this one is perhaps the best known. And I now know why. It was sublime and moved me to tears. Not in a boo-hoo how-sad kind of way, but in a deeply profound way. It was as if my bohemian heart of hearts was broken forever and my romantic dream of that cold water garret in which I suffered for my art died with my petite Parisian. I wept for the death of an ideal and, in a cold, corporate world, death from a different kind of consumption. It was a fantastic, moving evening and I applauded long and hard for all those involved.